There are few times when I feel less like a true Southerner than when it is time to spread pine straw. 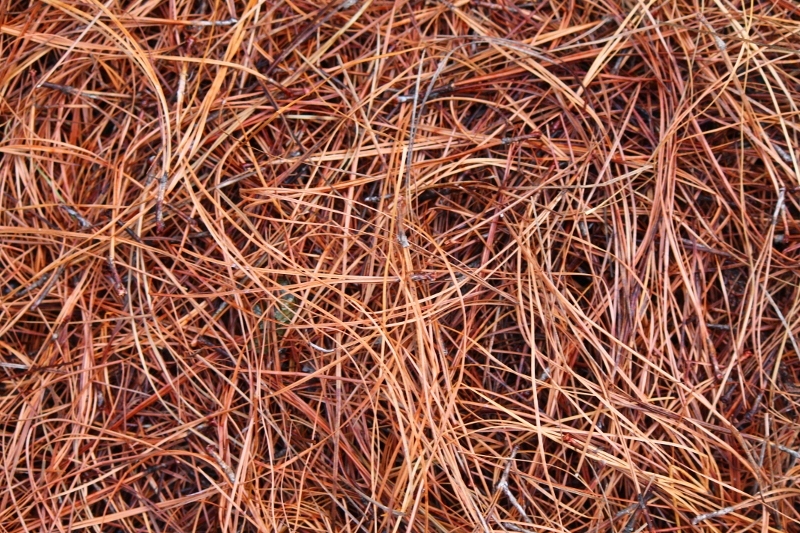 For those of you who are likewise not from around here, pine straw is really just pine needles, culled from the floor of southern pine forests or plantations. It is tied into bales and shipped on trucks to nurseries and hardware stores, where it sells for about $3 a bale. 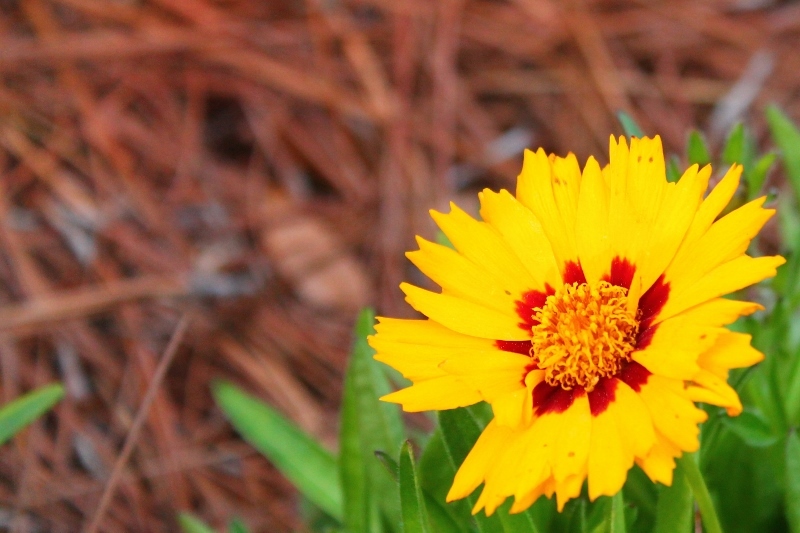 Gardeners and others who maintain landscapes purchase the pine straw and spread it as mulch in flower beds, around the bases of trees, and anywhere else we want to retain moisture and smother weeds. For those of you who have never lived anywhere but the South, you should know that this is the only place I know where pine straw is harvested, baled, shipped, sold, and spread in this way. When I lived in Boston, I had six pine trees on the hillside that was my back yard. Needless to say, I had plenty of pine needles in that small, sloping yard. Each spring, I would take my lawn rake and pull the pine needles off of the grass, the sidewalks, the flower beds, and the large rock outcropping which dominated my back yard. Then, I would discreetly distribute those pine needles all over the hillside where I didn’t want to have to mow. I went to great efforts to make sure that it looked like all of the pine needles just fell on that hillside; I didn’t want my neighbors to know that I was putting them there on purpose. It’s not that I thought they looked bad; I was simply afraid they would note my laziness, because respectable people in neighborhoods in New England would rake their pine needles into piles, stuff them into those brown paper sacks for yard waste, and leave them at the curb to be hauled away. Acceptable mulch for weed control and moisture retention in New England flower beds was shredded cedar or, if you were cheap, pine bark nuggets, purchased in bags at the local big box store. Similarly, every time my mother visits me here in Georgia, she gently expresses her concern about the pine straw. She was raised in western Montana, where they would spend a great deal of effort each year pulling the pine needles away from their flower beds and grass. The belief there, she said, was that the pine needles have too much acid in them, and leaving them in place will quickly kill your plants. Her fear of pine straw seems to be visceral; no matter how many times I assure her that everyone here uses the pine straw around their flowers and vegetables, she cannot be persuaded that it is safe. I just don’t bother explaining to her what the locals do with bacon grease. When I first arrived in the South, I did not have the courage to use pine straw. I dutifully drove to my local big box store (please don’t judge me), paid my $2 per two-cubic-foot bag, strained my back loading the bags of mulch into my car, and brought them home to spread around the flowers and weeds. The bagged product they have here which most appealed to me is cypress mulch. I was fine with my decision, even if it made me stand out on my block, where everyone else uses pine straw. A couple of years into the enterprise, though, I read that groves of cypress trees in the swamps of the South are being leveled to satisfy the cravings of suburban homeowners for the inexpensive bags in the big box stores. Oops. Since then, I have decided to take a “when in Rome” kind of approach to the pine straw. I figure that the people whose families have lived here for generations, who have spread pine straw since they were knee high to the proverbial grasshopper, and who, in fact, have built a whole industry around the harvesting and distribution of pine straw, probably know what they are doing. I would never say my mother is wrong, bless her heart; that would simply be bad manners. But I have wondered if there may be something unique about the interaction between the pine trees and soil in western Montana which makes the pine needles more harmful to bedding plants. And I certainly am not going to let the propriety of New England keep me from inexpensive, convenient methods of moisture retention and weed control, or at least I am not going to admit it publicly if I do. So this morning, after pulling weeds and rearranging some bedding plants hastily planted at the end of a tiring day late last spring, I got in my car and drove to a locally-owned nursery, where I casually told the person behind the counter I wanted four bales of pine straw, as if I had been asking for such a novelty all my life. After I paid, the kind lady hauled the bales off of the semi trailer where they have them stored, protected from the rain, and helped me stack them in the back of my car. I drove home and started spreading the pine straw in the places where weeds had thrived earlier in the morning. I have developed the technique for spreading the straw over the past couple of years, since I made the switch to using the local, renewable resource in my back yard. You can’t just dump the pine straw in chunks; you have to pull it all apart and spread it out evenly. Sometimes the best method is to step into your flower bed, take a clump of it in your hands and then start to rub your hands together, letting the needles fall freely on the ground. Other times, you have to pull at it some. In places where you need it more thickly distributed, you can go over the same area several times. Where there are plants, it looks best if you gently clear the stray needles off the top leaves and then lift the bottom leaves and stuff it underneath with your hand. As I was going through this process this afternoon, using methods I have learned only since moving to the South, I was thinking about my faith. I realize I may not be fashionable in saying this, but I believe there are truths about God and our relationship with God which are universal. But there are perspectives through which people see, understand, and live out those truths which are very local. The way I learned to think about God when I was in seminary in New England is not the same as the way my neighbors and friends in Savannah think about God. The way my mother began to interpret her experience of God when she was a college student in western Montana are not the same as the way people interpret their experience of God around here. Around here, people of faith are not concerned about the same proprieties that concern people in New England. Around here, there is something unique about the interaction of faith and daily life which help things grow differently than they grow in western Montana. And I realized that my garden grows better because of my “when in Rome” approach to mulch, and likewise, my faith is made more robust by a similar openness to growing in the place where I am planted right now. I find myself grateful to be able to develop techniques I never imagined I would use: pulling apart clumps of assumptions, letting language that is new to me fall freely around me, going over new ideas again and again until they are thick inside of me, clearing off stray thoughts, and even stuffing some concepts away for a while until I need them in the future. The whole process seems pretty effective in keeping the weeds in check and retaining the water which has been sprinkled over me.